Eczema or Dermatitis is a type of skin condition in which the skin becomes swollen, red, rough (inflamed) due to multiple causes. The cause may be in the body (Endogenous Eczema) or in the environment (Exogenous Eczema). Symptoms of Eczema have a varying character in various phases of the disease. These phases may be acute, sub-acute or chronic. Acute Phase (Eczema that has a recent onset): Redness, Swelling, Formation of Blisters that ooze moisture and become crusted. Sub-acute Phase: Redness, Dark coloured patches with scale formation and crusting. Contact Dermatitis: It occurs due to coming in contact with chemical irritants like acids or alkalis. Symptoms include burning of the part first then redness, swelling, blisters, pus filled eruptions or large blisters. If the irritant is exposed to skin for long and repetitively, then cracks or fissures may occur. Contact Allergic Dermatitis: It is a type 4 (cell mediated) hypersensitivity reaction to many antigens in the environment. It can occur due to contact with artificial jewellery, nickel, leather goods, plastic, hair dye in sensitized individuals. The appearance of such eczema varies depending upon the phase involved. Seborrheic Dermatitis: It is a type of eczema which is seen in individuals who commonly have hyperactive oil glands. It usually begins in early adulthood and males are commonly and more severely affected. It is characterised by red blotches and eruptions topped with yellowish oily scales. In severe cases, fusion of neighbouring patches results in red patches and large areas covered with thick yellowish white oily scales. Atopic Dermatitis: This is a condition of altered reactivity to common and mild stimuli. Temperature changes, or contact with woollen clothing induces itching thereby initiating itch- scratch- itch cycle. With different ages, the parts affected may differ. For eg. in infants and children, it is seen on face and extremities and folds of joints. Lichen Simplex: Chronic Eczema affects mainly adults, is characterised by fairly well defined, hyper pigmented patches. There is prominence of normal crisscross skin markings. The skin becomes thickened and may occasionally show tiny crust and erosions. Usually areas involved are the areas where it is very easy to rub like dorsum of feet, ankles, wrist, extensors of forearms and posterior neck. Xerotic Eczema: It happens in individuals with dry type of skin, especially in elderly and children who tend to develop it during winter. Sypmtoms include itching with dry light coloured, ill defined patches and fine scales. Oozing, crusting, and fissuring occur later on. 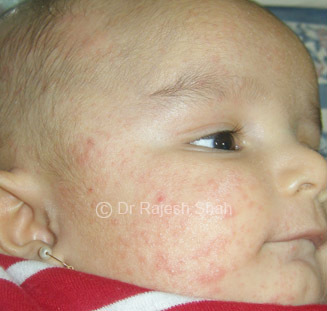 Nummular Eczema: It is characterised by nummular i.e. coin shaped areas of acute and subacute eczema over extremities especially back of fingers, hands, and feet. Coin shaped areas of redness, itching, papules scaling and crusting are seen. Some nummular eczemas get lichenified. Stasis Eczema: This eczema occurs around the ankles in a setting of pooling of blood in the leg blood vessels. Stasis pigmentation, varicose veins or ulcer may accompany the eczema lesions. Leg elevation, supportive bandages, avoidance of antiseptics and antibiotics that may irritate and sensitize the skin and a topical steroid cream are necessary. If you too have been suffering from any signs or symptoms of eczema, do get in touch with us at Lifeforce Homoeopathy. Dr Shah’s research based homoeopathy has shown very effective results. hair falling i can be bald withing next few years.